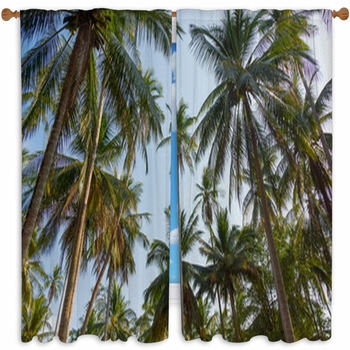 Tall and slender, always green, and always waving in the wind, palm trees are the ultimate symbol of a sunny and relaxing paradise. 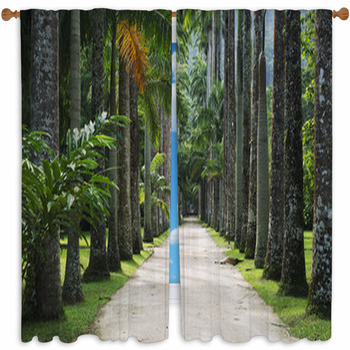 And now with our palm tree themed window curtains, you can bring these majestic yet delicate trees into your life, even if you live in a congested city or treeless suburb. 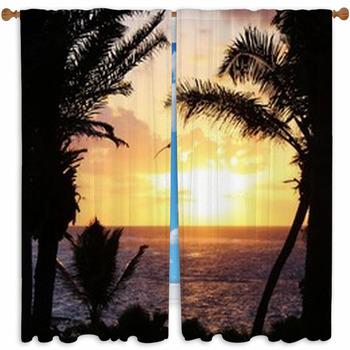 Give your bedroom a romantic atmosphere with window curtains featuring a scene of palm trees at sunset. 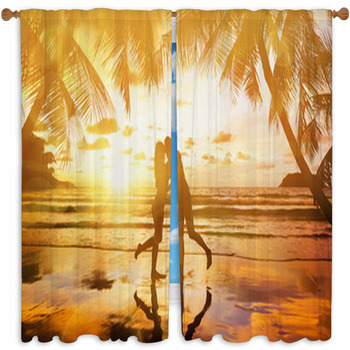 In one image, a dozen palm tree silhouettes are seen against a purple sky, above the silhouettes of thatched tropical beach umbrellas. 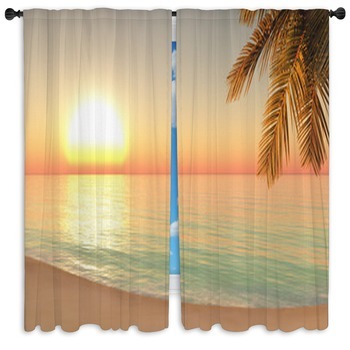 In another window curtain design, three palm trees are silhouetted against an orange and blue sky, with the setting sun visible as a yellow disk on the horizon. 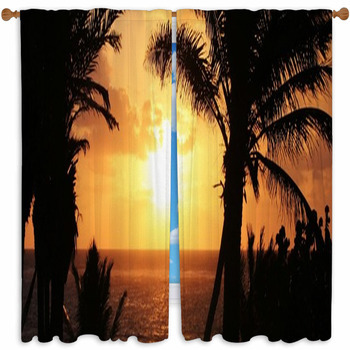 Or how about a vista of a shadowy island seen from the shore of another island, with two palm tree silhouettes framing the distant island and the golden sun that is descending towards it? If you prefer the cold drinks, warm sun and cool currents of the daytime, bring a burst of sunlight into your living room with a set of drapes or custom size window curtains displaying a bright palm tree image. 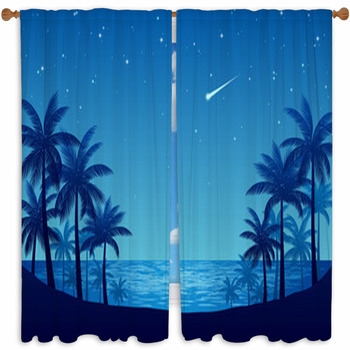 Choose palm tree window curtains decorated with an illustration of four palm trees leaning out over the ocean. 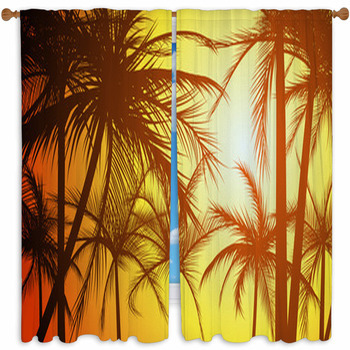 These palm trees are part of an abstract design that includes a brown beach, three dolphins leaping out of white water, and a background pattern consisting of light blue dots and a splash of orange, turquoise, green and purple. 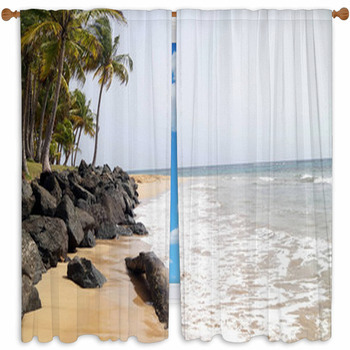 If you want a realistic depiction of palm trees in your living room, hang window curtains displaying a photo of a single palm tree tilted towards the blue ocean from the tan sand it is growing in, as fluffy white clouds meander over island mountains in the distance.